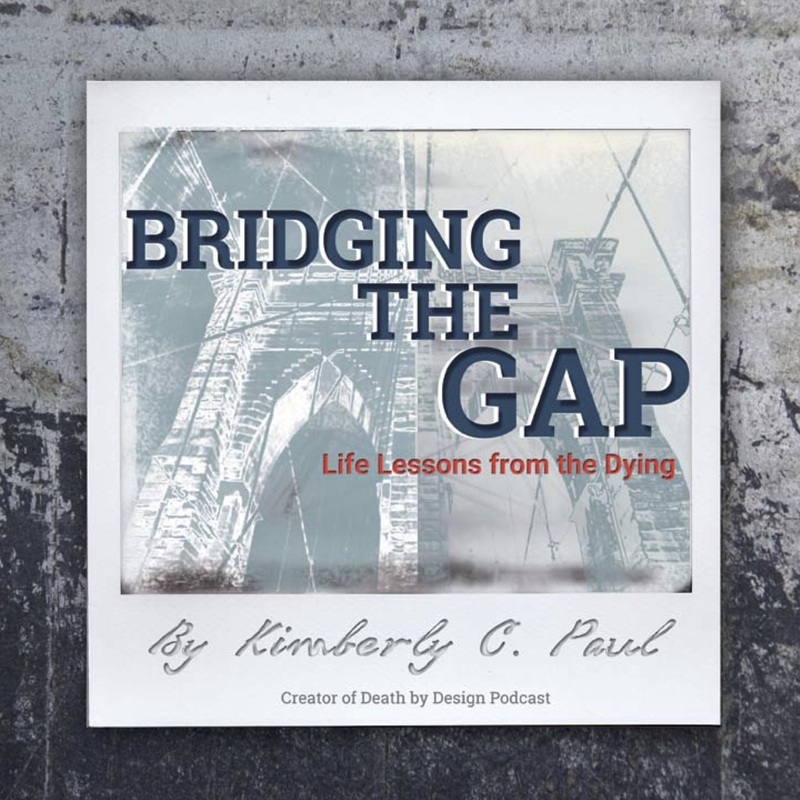 Bridging The Gap can be purchased on www.deathbydesign.com. All my life, I wanted to create, write, produce, and tell stories that could stir the human soul. It was in my DNA, or so I thought. Since I was twelve, New York City beckoned me. And this was confirmed when, within weeks of living in NYC, I landed the ultimate internship at Saturday Night Live. I was young, a dreamer, and would do anything to learn the ways of the network television. I thought I was living a dream life, until the dream was not enough anymore. It wasn’t what I was looking for in life; something was missing. I wanted to tell stories, authentic stories that could change how individuals lived their life. I never knew my desire to tell stories would lead me to a controversial subject such as death. It was a dramatic change from New York City skyscrapers to the small southern coastal beach town of Wilmington, NC. It was not a hard decision to trade my high heels for flip-flops. When I arrived, the one major television production network was on hiatus, so I looked for a temporary job to pay the bills. At the time, I never knew that this temporary job would end up being a career. I didn’t know that life was conspiring to put me on a path that would prepare me for the ultimate loss of my life. Yet, it was the individuals facing the end of life who taught me some of the greatest lessons about life. Throughout my seventeen-years of work at hospice, the people who were dying taught me about living. These lessons would ultimately change how I live, love, and how I would one day plan to face the end of my own life. These individuals on their deathbed taught me to pay attention to what mattered most in life. These life lessons weren’t like a bolt of lightning from the sky, rather they were slow revelations over the two decades of conversations I experienced. My job was to gather patients’ stories in order to bring awareness to choices at the end of life. I never knew these stories would open up a passageway and provide a rare glimpse into what matters most in life. These stories changed the direction my life was headed in. By listening to stories of the dying, I was learning how to live, live well, and it had nothing to do with titles, money or fame. These simple life lessons are often forgotten in the lives of those of us blinded by the daily minutia, unaware that our time on earth is limited. We rush from one thing to another. It might be for the family, for the job or even for our community, but we are so busy we forget to notice the small miracles happening every day in our lives. Slow down, open your eyes to the present moment, I promise you will see miracles occurring all around you. We avoid hard conversations with those that matter the most. The conversations could be about hurt feelings, broken hearts, or end of life and advanced care planning. We all avoid hard conversations, but it is these conversations that make relationships stronger, give them room for growth and make them meaningful. In addition, it is important to always view life from another perspective. By seeing life from someone else’s viewpoint it can instantly change your opinion about a situation. As we rush through life, we forget to recognize the blessings afforded to us. It is only when you lose these small things do you realize they were not so small after all. The gift of standing and washing dishes—we will only realize this gift when we are no longer able to stand, feel the warm water over the dirty dishes that nourished those we love. We need to learn to take pleasure in the small things every day of our lives. Half the battle in life is won when we show up. At times, no words can heal, but being present, just showing up during the hard times is the only thing we can do. The hard times is what makes the solid foundation for good times and builds trust, giving permission to those you love to be open and vulnerable. We love to hold back forgiveness from those who have hurt us; but the burden of holding back forgiveness only weighs down the individual carrying it. I’m not saying everyone needs a scoop of forgiveness without a side of boundaries. I assure you, withholding forgiveness will only hurt you. Let go, set necessary boundaries and move forward. Some people say, “If you want to see unconditional love you must observe dogs and toddlers.” In fact, I would also add “dying individuals” to that list. When time is limited, what matters most is LOVE. Receiving LOVE and giving LOVE in an unconditional way with no strings attached is the truest gift you can give another and to yourself. We often forget the most innovative minds over the last decade did not graduate from a college or a university. And you know what, my Granny didn’t either, but the lessons she taught me about life and living are tattooed on my soul. We forget to place value on life experiences, the struggle it took to become wise, and the power of wisdom it takes to be a gifted, inspiring leader. Our education system does not create leaders; wisdom of years lived creates leaders, not a piece of paper from an expensive school. Please don’t waste your time trying to figure out the mystery of life. I’ve wasted enough time for both of us. I’ve searched, read tons of books, graduated from college, almost finished grad-school, but I’ve never in all my searching discovered the mystery behind LIFE, except to embrace that maybe Life is just a mystery and to accept that as fact. Throughout my life I’ve heard a lot about finding closure with individuals lost to death, lost relationship and unexpected circumstances. I’ve learned at the bedside of the dying that closure is a myth. When we love someone and lose someone, closure will never be found. We just learn to rebirth ourselves to a new life. This is what I know for sure: Learning to trust your inner voice of wisdom is one of the hardest lessons you have to learn in life. Yet, trusting yourself, your gut, will provide a life compass to a new world of unexpected expectations. Go still, go quiet and listen. It might come to you in a whisper or it might be a harsh slap in the face, but it is a wakeup call to engage in something bigger than ourselves. I’m here to provide everyone permission to grieve on your own timeline. Grief cannot be rushed; it is a process, a true labor that could take a few days, a month or even years. It is okay to cry. It is okay to allow grief to come in waves of emotions. Embrace where you are at in your grief. Rushing through grief will only create other issues in your life. To always be you, be authentic, and be real. This life lesson seems so simple, but is so hard to implement in our lives. We are consumed with comparing ourselves to others, be it movie stars, or what the television tells us who and how to be. What I learned is if you are brave enough to embrace who you are, imperfect as you might be, no one is exactly like you in the entire world. Embrace your uniqueness and celebrate individual differences. Only the weak are fooled by peer pressure. These twelve life lessons (simple, but extremely hard to implement) have changed my life. From telling scripted stories to embracing real, authentic and inspiring stories of ordinary individuals living an extraordinary life inspired me to follow in their footsteps, and implement the life lessons I learned. Looking back, I never realized it would have such a major effect on my daily choices. It is strange how you somehow forget that you could change someone else’s life or they could change yours. It is so slow, this change, that you don’t even know it’s happening until the transformation is completed. Working with the dying has inspired me to never lose hope in the mysteries of human connection. These twelve simple life lessons taught me how to truly live an imperfect life wholeheartedly, knowing well that one day this life will come to an end. life. As Vice President of Outreach and Communications for Lower Cape Fear Hospice in Wilmington, NC, she created a myriad of award-winning marketing strategies to share real stories of how hospice patients and their loved ones face the end of life journey.